One of my close peers wanted to discuss Apple this week. He is a big fan of Apple products and is excited that my wife has decided to take the plunge into MacWorld this holiday season on behalf of my two rapidly growing sons. Since we own Apple in our Global Opportunities portfolio, I was all ears. He suggested among other things that Apple should display some seasonality. He suggested that there may be a lag on stock performance during December; but, once holiday sales numbers are released and Apple enters a new product release phase, the stock could move higher. As always, I was a bit skeptical. I don’t question that Apple has positive return prospects, but a predictable pattern to the timing of these returns is a bit much to swallow. My main rebuttal stems from the Efficient Market Hypothesis (EMH). If you believe, as I do, in some degree of efficiency in the market place, you would naturally doubt a thesis that would equate excess returns to seasonality. EMH was formalized by Eugene Fama of the University of Chicago. His research spanned the early part of the 1960’s and his thesis was published in two forms; first as “The Behavior of Stock Market Prices” in January of 1965 and subsequently as “Random Walks in Stock Market Prices.” Fama made the random walk of Wall Street famous, but the seeds were sown in 1863 by , French broker, Jules Regnault; the first credited with observing that stock prices seemed to display no statistical correlations. Others to champion the idea include Louis Bachelier with his turn of the century publication of “The Theory of Speculation;” Alfred Cowles in the 30’s and 40’s; and also Paul Samuelson at or about the same time as Fama. After further review, Eugene Fama revised his theory. There was enough empirical evidence to contradict this theory to cause him declare that market efficiency was not an absolute but did exist in 3 forms. Weak form EMH – Market prices reflect all past, publicly available information. Semi-Strong form EMH – Market prices reflect all past, publicly available information and instantaneously adjust to new, public information. Strong-Form EMH – Market prices also reflect all non-public information. Simply believing in the weak form of EMH is reason to be skeptical of excess returns related to predictable seasonality in Apple. Before looking at the potential for seasonality in Apple, let me first discuss some insights not immediately apparent on the idea of efficient markets. The existence of EMH allows academics to pursue the modeling of asset prices through statistical descriptors, a mean and probability distribution. What Weak Form EMH says is that at any given point in time, based on all public information, the price of an asset is at its mean. 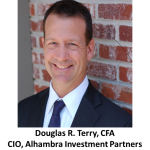 What Semi-Strong EMH says is that when new information is available, assets will immediately move to the new mean. Strong Form EMH says that market prices are at their mean even in cases when someone is in possession of insider information; there is never an excess return that can be expected at any point in time. What leaps of faith does one need to buy this theory? If any one market participant was in possession of information that would indicate that prices should be other than their current price, he (she) would act upon that information and realize a riskless profit. The distribution of capital among participants is such that no one player can overwhelm the market. There has been much critique of EMH and my academic and trading experience indicate that there are holes in the theory. For the most part the theory has merit, especially for very short and very long time horizons. But the theory cannot be accepted blindly at face value. Weak Form EMH, OK, but I do not accept that markets reflect non-public information. It is illegal to trade on non-public information.  Surely, some commit insider trading crimes and are never caught; but, the disincentive to do so, jail time, prevents me from buying Strong Form EMH. My personal experiences as a trader indicate that capital can be concentrated. Leveraged hedge funds and investment banks abetted by Fed liquidity definitely have the capacity to manipulate markets. Bubbles, end of reporting period portfolio marking and central bank intervention are a few examples. To conclude, one can accept a certain level of Weak Form EMH but must be aware of the hidden inefficiencies from the existence of non-public information, psychological biases and concentrations of capital. Remember that an investor like George Soros will go to the media in an attempt to elicit overreaction. When reading or listening to investing media, always have the shortfalls of EMH in the front of your mind. On the Semi-Strong form of EMH, I do believe that markets react quickly to new information. I purposefully use the word “quickly” rather than “instantaneously.” For most market participants the two are, for all intents and purposes, the same; they do not have the market access of a professional market maker to allow one to take advantage of standing orders. To some extent, even professional market makers do not get much advantage; liquidity is most often very poor during large market moves, especially in the case of a major economic data release. If you’ve ever seen the movie Trading Places with Dan Aykroyd and Eddie Murphy, the scene in the Orange Juice Futures Pit during the release of the harvest data is eerily similar to trading bonds during the announcement of a big unemployment number or oil during a major middle eastern event. Finally, Strong Form EMH has too many holes to accept except from an extremely long or short term perspective. From an extremely short term perspective and an extremely long term perspective EMH has merit; but, in between, there is overwhelming evidence that inefficiencies do exist. Back to Apple and the suggestion of seasonality. For a short term arbitrage profit to exist, we would expect that the seasonality is not public knowledge. The amount of analysis done on a high profile stock such as Apple would suggest that this is highly improbable. The exercise to look for possible seasonality proceeds as followed. First one looks at the data in graph form to see if any trends emerge. The monthly return graph is a bit congested but there does look like the possibility of some pattern, especially over the last three years. I would then manipulate to get a closer and different view. I choose to look at average monthly data for the last 10 years. There looks to be the potential for very small excess returns in Feb, Mar, Jul, Sep and Dec. One must ask if there is any valid economic reason for this. December might be the anticipation of sales growth indicated by popularity of the product during this high sales volume month. 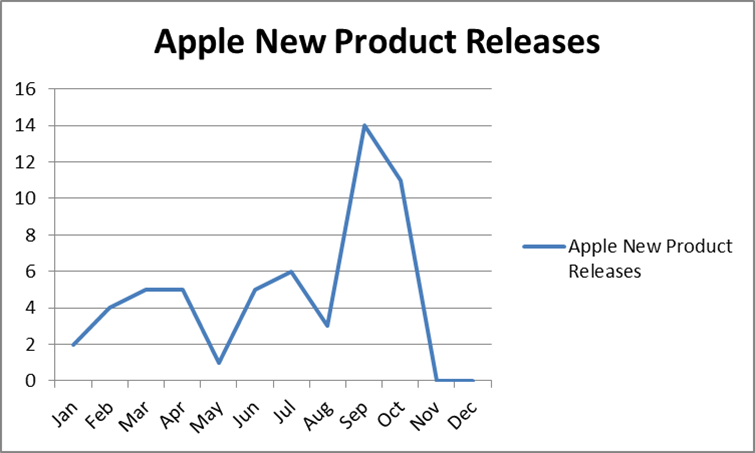 For insight into the other months, lets look at Apple’s new product releases by month. It does appear that Feb and Mar start the annual product release cycle, which pops a bit in Jul and peaks in Sep just in time for the upcoming holiday. 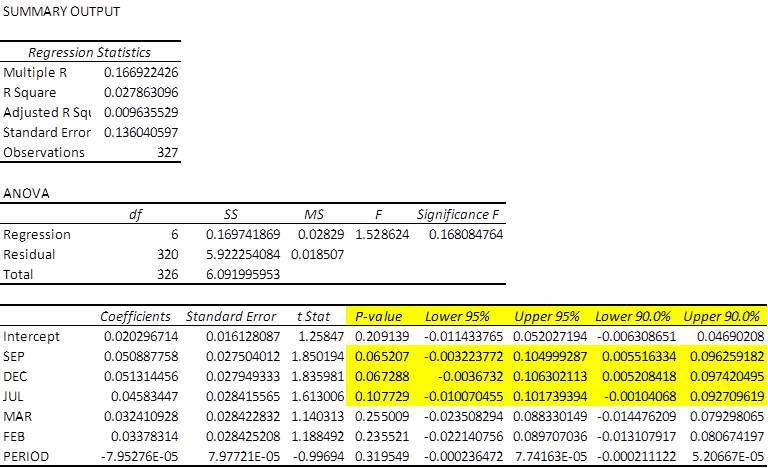 We then formulate a multiple regression equation with dummy variables 1=yes seasonality, 0=no seasonality. If a coefficient proves statistically significant, it would indicate the presence of excess return in those month. Low and behold there does seem to be statistically significant data. Here’s the regression for the last 10 years and repeated for the history of Apple back to 1984. 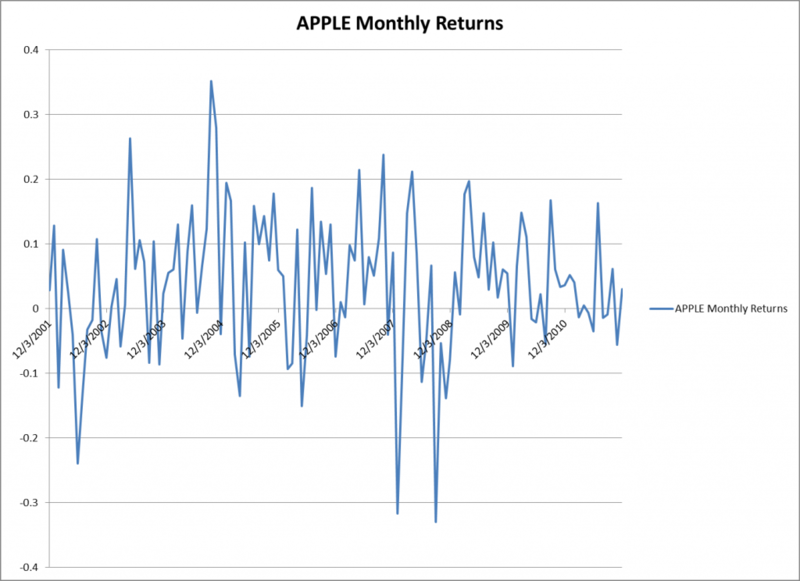 This basically says that we can not reject the hypothesis of no seasonality in returns for Apple in the month of September for the last 10 years. This is a big product release month leading into the holiday season. 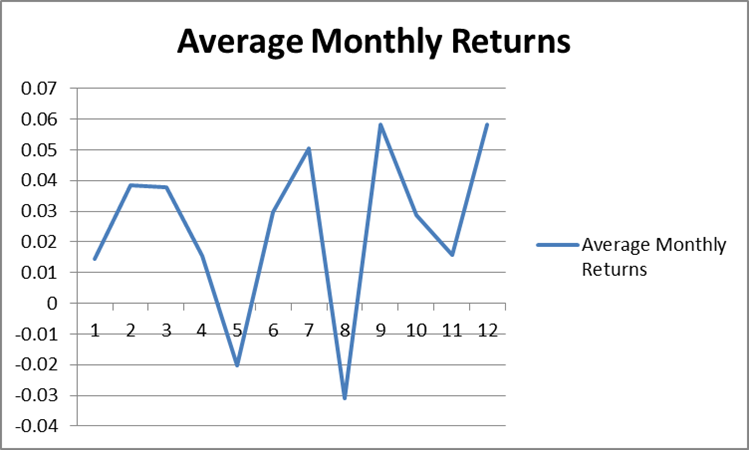 Owning Apple in this month would appear to give one returns in excess of 7% relative to the average month of 2.6%. Feb and March show positive excess returns which are not statistically significant based on the standard deviation of returns in those months. Here is the regression back to 1984. We see that in the past there has been more statistical significance to returns in Dec which have most likely been eliminated over time, indicative that investors have a preference for buying the stock in Sep instead. The regression says that on average Apple has returned 3.05% per month for the last 10 years and that in September investors have wreaked 7.1% excess returns. Based on this analysis one will not reject this hypothesis with 90% confidence. 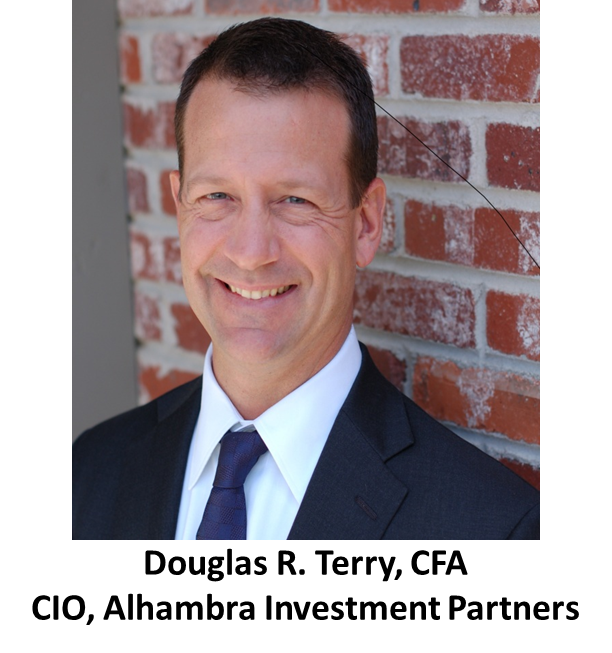 Based on the standard deviation of returns, the expected range of excess returns in September is between 1.1% and 13.1%. 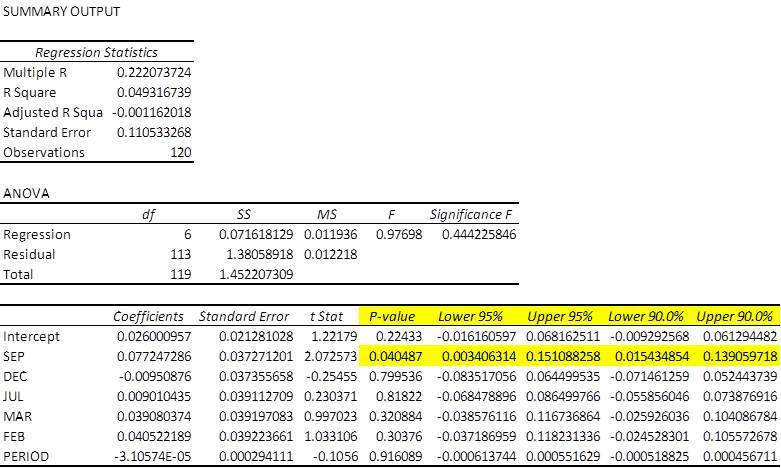 The other take-away from the analysis is that the regression taken as a whole is not significant, showing an R-squared of only .03 because of the high standard deviation of monthly returns predicted by the model of 10%. This tells the investor that Apple has been a very volatile stock over the last decade and contains risk of lose. 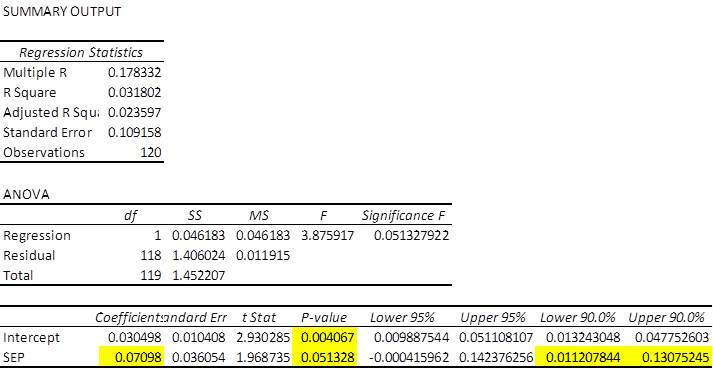 The existence of statistically significant excess returns in the month of September argues against efficient markets. It says the markets, or the participants in the market, may not be as smart as we once thought they were. These results are based on historical data and are the opinion of the author. This is no guarantee of investment results and should not be taken as investment advice.